From a tourism perspective, we know Spain and Portugal inside out. Totally Spain’s staff live and work in Spain and we’ve been doing what we do since 2000. We know and have visited many times all the top cities like Madrid, Barcelona, Bilbao, Seville and Granada in Spain & Lisbon and Oporto in Portugal. We also know the smaller second-tier cities like Malaga, Segovia, Burgos, San Sebastian, Evora and Coimbra too. Places where insider knowledge really counts. Totally Spain only handles custom trips for Spain and Portugal, and without a doubt it’s this firsthand knowledge that makes us so reliable, the experts in what we do and our custom trips go so smoothly. Our headquarters are here in Northern Spain. Vital when creating and producing custom itineraries we believe. Some might suggest it doesn’t matter, but wouldn’t you prefer to deal with somebody reliable on the ground? Not only it means we are available to clients when they are here – but we are able to develop and maintain meaningful relationships with hoteliers, restauranteurs, private guides, drivers, activity organisers and more. We get a real buzz every time our custom trips meet with or exceed a new client’s requirements. Even if it’s a short trip to well-known destinations, we try to innovate and add in creative elements that personalise the trip. And when it’s for an unusual location or a niche special-interest group (see our architecture, agriculture, winery and gardening trips), we can really flex our muscles and hit our extensive contacts database – to create a highly-tailored completely unique experience. For us the best compliment is a repeat or referred client – and, thankfully, we’ve had many over the years. Is everybody in your group arriving from a different location and on a different day? Are some splitting off on separate sub-trips? Any dietary requirements other companies might be challenged by? Mobility issues to consider? Multi-generational interests to factor in? We handle such special requests and more daily. Nothing phases us when it comes to travel planning – we’ve planned for every special interest group and family dynamic imaginable. All that matters to us is you experience Spain and Portugal as you want, in as smooth a fashion as possible. Who you know, works in all walks of life, and travel planning is no different. We constantly seek great people to collaborate with as they really bring our client’s custom trips to life. And we truly value the experience of our long-standing local experts. As do our clients who frequently write to us to praise the Totally Spain guides and drivers they encountered. There really is no better way to get a sense of a place than by meeting up with a local expert – and we make sure we have the best professionals on our books for every destination. Reputations are easy to write about but not so easy to manage. We know our reputation depends on the relationship we develop, not just with our clients, but also with our providers. When you’ve done this successfully for 17 years, you know that your clients will be treated extremely well at their hotel and by their private guides and drivers – and vice-versa. And because we’ve been consistently reliable to work with for so long, we know that when a client’s flight is delayed or cancelled, a client becomes ill, or their passport goes missing, our providers have our back – just like we have yours! Spain doesn’t always cloak itself in glory when it comes to great customer service. And sometimes, when service might be considered excellent by Spanish standards, it can be misinterpreted by visitors from outside Spain. Take, for example, a client ordering wine in a tapas bar. Seeking out eye-contact will rarely get you that Rioja or Ribera. You may have to shout your order in. And smiles are often optional. We don’t set out to change this – it’s a part of Spain’s culture and we can’t intervene in what, from the outside seems to be quirky – but we make sure to work closely with providers who also value great service. That might be a hotel that can handle special dietary requirements such as kosher-style or vegan meals or a restaurant that can serve meals a little earlier than local Spanish mealtimes. We only place our clients in hotels, restaurants and experiences where we are more than confident that our clients will extremely comfortable and well-looked after. Language fluency is another area that impacts on a client’s experience. Not only at the booking stage (not in our case, of course, as you can probably tell, we are all fluent speakers) but when a client is travelling around – especially outside the big cities. Whenever we are researching our trips and come across a private guide, driver or concierge with great English and great local knowledge plus a sense of humour (invaluable in this field), we retain their details, safe in the knowledge that they’ll be perfect for our next group of clients to that location. 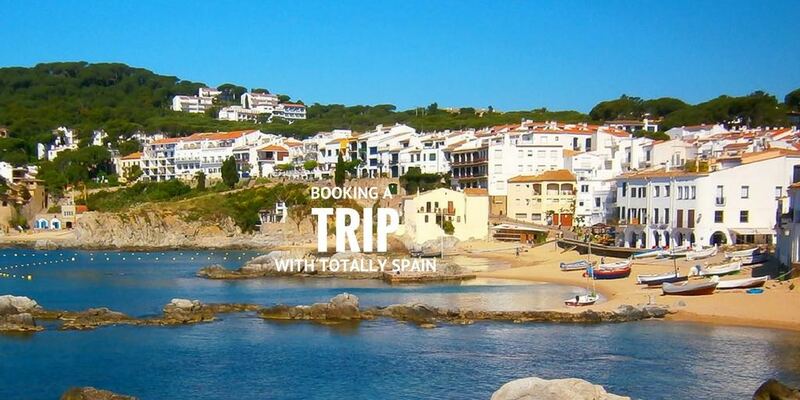 Wherever you want to visit in Spain or Portugal, the beauty of travelling on a custom itinerary with Totally Spain is that all the planning takes place before you leave home, and requires very little time, on your side. By the time you depart home for your trip, a program that appeals to everybody in the group has been set in place months in advance and all you need to do is relax and enjoy all the elements that have been carefully chosen and prebooked for you. Even if something happens to challenge the itinerary, you can easily contact us and we’ll sort it out. That’s stress free, smooth travel. When we started our business in 2000, we set up in the Basque Country where Bilbao’s Guggenheim had just opened. We were very familiar with the region (our director Belen Encinas is from Vitoria) and used our experience in other travel businesses to create innovative tours with a focus on gastronomy, architecture and wineries. Fast forward 17 years later and we are still providing a similar service. We still rely on our insider knowledge to create custom itineraries for families and groups exploring Spain and Portugal. But what we know now, that we didn’t know then, is that that the most important skill in travel planning is listening before offering any solid advice. You do that by asking the right questions. And then, and only then, does our insider knowledge come into play. That’s how we create custom itineraries that go way beyond what clients thought would be possible. As you might have guessed by now we don’t sell ‘off-the-peg’ itineraries. We only start planning a trip when we are contacted by a client. We rarely sell the same trip twice. Why work this way? We don’t serve a high volume ‘tick-the-box’ kind of tourist. We want to create meaningful holidays and trips for each and every client. We appreciate that each person who contacts us is unique and we want each custom trip to reflect the people taking the holiday. Not only do we advise when, where and how to travel, we really are your ‘one stop shop’ for hotels, restaurant reservations, car-hire, rail tickets, food tours, privately guided tours and private drivers. And we can look after your entertainment – whether that’s tickets to a flamenco show, a jazz concert or a private tour of the best wineries. We’ll help you to get the most from a trip providing suitable tours, activities as well as advice on unmissable dishes, the best travel apps, wifi access, where to shop and whatever else you have questions about. Nothing is too much trouble for us. If you have a question or a request, we’re here to answer it for you. If you are planning something special in Spain or Portugal– we’re here to help you create and manage the magic moment. We’ve handled proposals, honeymoons, romantic getaways, special birthdays and lots more emotional occasions. (Think of all the providers you need to find and co-ordinate for these events!) We’ve even helped clients retrace their Jewish heritage in Spain and Portugal. We feel enormously privileged to have been involved in creating so many wonderful occasions for our clients. If you have a trip in mind that requires something a little bit special, get in touch – we’d love the opportunity to work with you and create an incredible trip. We want each client to get a real sense of what they’re doing before they leave home so we personalise a detailed documentation pack for every client. What does it include? In addition to our own Totally Spain city-guides for each location, we also customise city maps by highlighting all the locations our clients ‘need to know’. We’ll put a ‘x’ where the hotel is, and circle all the other important meeting points for that destination. We do the same for driving holidays by marking out the itinerary on a map. We also include a day-by-day written itinerary which details what’s happening when and provides all the contact information a client needs. We create this pack because it’s highly practical and ensures our clients have a smooth trip. They can easily find where they need to be and who is meeting them. And when there’s ‘free time’, they’ll know whether they are near any of the best attractions and historic landmarks, plus places to enjoy a drink or some tapas. We hope this inspires you to get in touch with Totally Spain if you are planning a trip to Spain and Portugal. Nothing would make us happier than hearing from you today. Posted in The Travel Industry, Totally Spain, Useful Information and tagged attractions, custom travel, families, groups, hotels, itinerary, Portugal, restaurants, smooth travel, Spain, special interest trips, tour operator, travel experts, travel planning, trip advisor.